Members of the Sledge family at Georgia Cottage in Mobile in 1942. 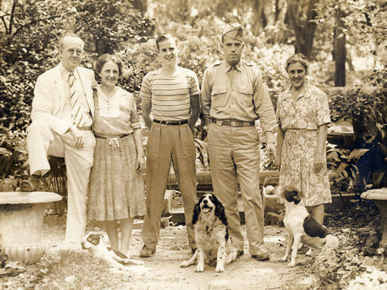 From left: Edward Simmons Sledge, Mary Frank Sledge (Sturdivant), Eugene Sledge, Lt. Edward S. Sledge Jr., and Mary's sister, Octavia Wynn (Sturdivant). When this photo was taken, Edward was on leave from the Army and Eugene had not yet joined the Marines.